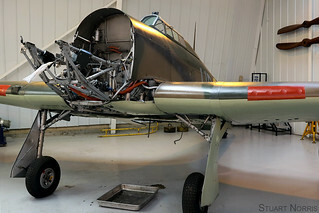 R4118 at Old Warden in December 2017 during her annual maintenance. At the time the photo was taken her Rolls Royce Merlin III engine was being repaired and her tail and control surfaces had been removed. A geniune Battle of Britain veteran she flew 49 sorties from Croydon and shot down five enemy aircraft while part of 605 (County of Warwick) Squadron.